Welcome back to the week, Kotaku readers. Can we get you some off topic conversation? Excellent! Then just sit right there while we prepare some for you in the comments. We can talk about Batman, South Park, The Dark Tower... whatever! Did anyone happen to catch that trailer for The Avengers this weekend? That looked like it has promise, based on the barely visible, story-free teaser for the Joss Whedon film. And who hasn't yet read Wired's excellent story on the discovery of Stuxnet, the virus that was (seemingly) designed to attack Iran's nuclear power program? Well, you can change that! If you want something more bite-sized to read and talk about, here are a few conversation starters. First look at season 2 of The Walking Dead - Well, I'm excited! Borders to liquidate - End of the book retailer to put more than 10,000 out of work. Universal steps away from ambitious project based on Stephen King's The Dark Tower - Likely no movies or TV movies as Universal reportedly couldn't make the budget work. The Dark Knight Rises teaser in HD is online - You've probably seen it by now. If not, expect the lightest of teases. Superman's new costume is a t-shirt and jeans - DC Comics unveils cover of Action Comics #1. This rebooted universe is starting to really confuse me. 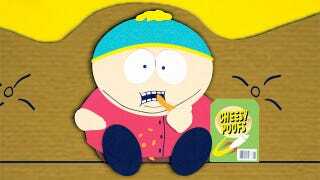 South Park's Cheesy Poofs made real - As part of a 15th anniversary for the show. Coming to Walmarts and Comic-Con.